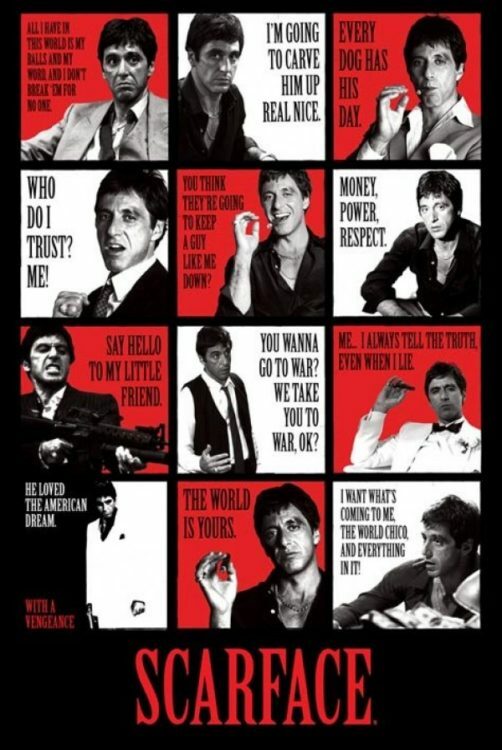 One of the best movies ever made, Scarface is a 1983 film about a Cuban political refugee, Tony Montana, who in the early 1980’s entered America to live the ultimate American Dream. He always wants more, and patience is not one of his traits. While in Cuba, he didn’t have anything, and now he wants it all. 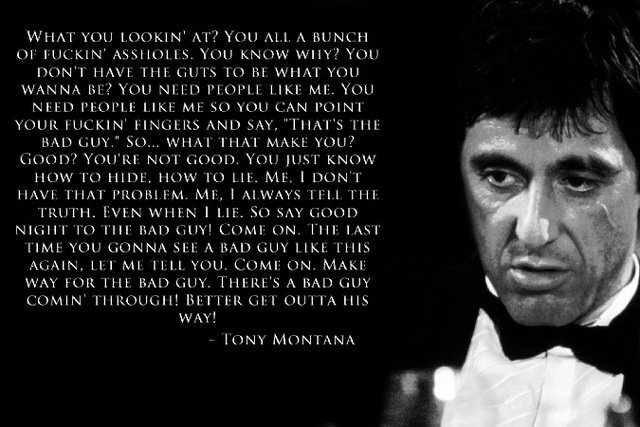 Scarface offers up some harsh truths about living one’s life. 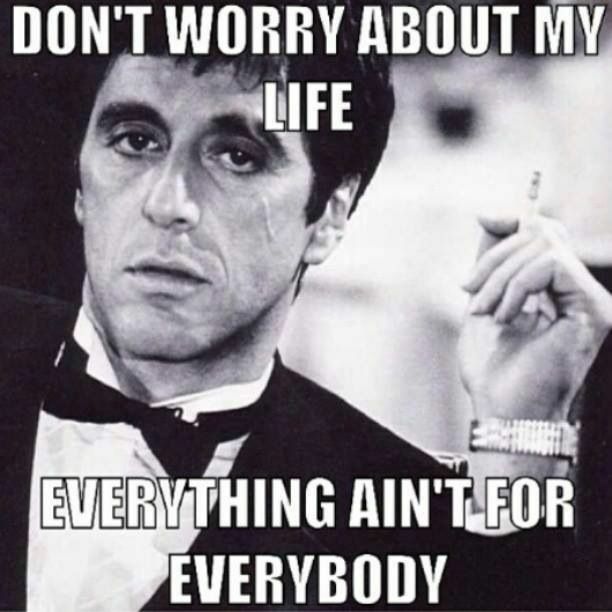 What I try to tell you? This country, you gotta make the money first. Then when you get the money, you get the power. Then when you get the power, then you get the woman. 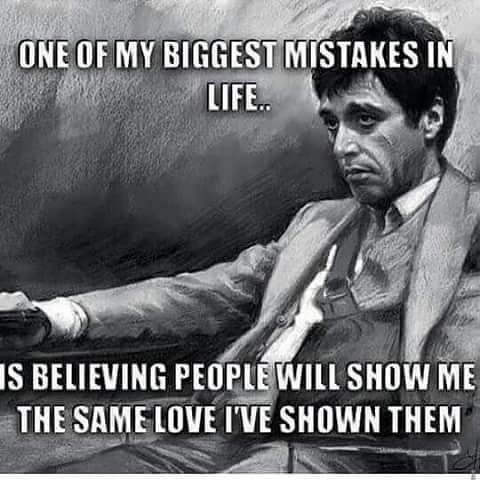 That’s why you gotta make your own moves. Good? You’re not good. You just know how to hide, how to lie. Me, I don’t have that problem. Me, I always tell the truth. 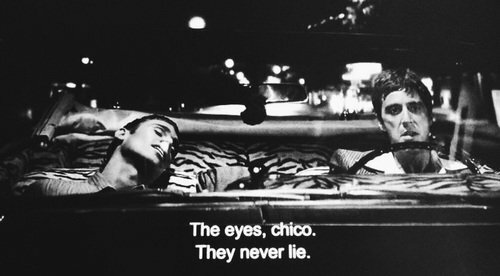 Even when I lie. All I have in this world is my balls and my word, and I don’t break them for no one. Do you understand? Would you kiss me if I wear the hat? Is this it? That’s what it’s all about, Manny? Wanna you waste my time? Okay. I call my lawyer. He’s the best lawyer in Miami. He’s such a good lawyer, that by tomorrow morning, you gonna be working in Alaska. So dress warmly. You know what capitalism is? Gettin’ f*cked! Okay, here’s the story. I come from the gutter. I know that. I got no education but that’s okay. I know the street, and I’m making all the right connections. With the right woman, there’s no stopping me. I could go right to the top. You a communist? Huh? How’d you like it, man? They tell you all the time what to do, what to think, what to feel. Do you wanna be like a sheep? Like all those other people? Baah! Baah! I never f*ck*d anybody over in my life didn’t have it coming to them. Did you get that? All I have in this world is my balls and my word and I don’t break them for no one. Do you understand? That piece of sh*t up there, I never liked him, I never trusted him. For all, I know he had me set up and had my friend Angel Fernandez killed. But that’s history. I’m here, he’s not. Do you wanna go on with me, you say it. You don’t, then you make a move. You got nothing to do with your life, man. Why don’t you get a job? Do something, be a nurse. Work with blind kids, lepurs, that kind of thing. Anything beats you waiting around all day, waiting for me to f1ck you, I’ll tell you that. You should have kept your mouth shut, they’d have thought you were a horse and let you out. Sanitation? I told you to tell ’em that you were in a sanitarium. Not sanitation, sanitarium. You know what? F*ck you! How about that? I kill a communist for fun, but for a green card… I’m gonna carve him up real nice. Reconnect with your dreams and get inspiration with Tupac quotes.